TOP AMBITIONS: I had my eyes set on the top job and each career move provided me with a solid foundation and required skills to understand and drive the business forward. DETERMINATION AND the right educational background can account for a lot in today’s accounting, auditing and finance world. The profession is evolving at a rapid pace and Khalil Fawaz is testament to this. Accounting has gone beyond number crunching and now involves exciting work that supports corporate strategy and growth. This not only means greater job prospects and a higher level of gratification, but requires accountants to evolve with the times. And professional training and certification is proving to be the way forward. This is why Khalil’s journey from accounting and auditing to CFO, and finally to the new CEO of Morgan International is inspiring and indicative of the times. According to the young CEO, accounting and auditing has played a significant role in the evolution of his career. 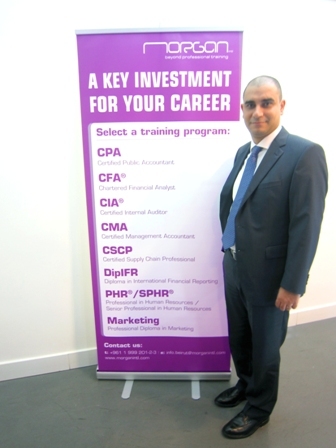 Khalil has a Bachelor of Business Administration, is a Certified Public Accountant (CPA) and has an MBA. This helped the 33-year old executive to begin his journey in accountancy and ensured he stayed abreast with new developments and trends over the years. He says the positive impact and priceless value his education gave him is what garnered his interest in Morgan International. A professional training provider, Morgan International represents leading international institutions offering a wide range of programmes for designations in Accounting, Auditing, Finance, Logistics, Facility Management, Marketing and Human Resources. First established in Beirut in 1995, the firm is now present across 34 locations and helps thousands of candidates per year to succeed. Morgan International offers workshops, in-house training and full programmes for designations: CPA, ACCA, CFA, CMA, CIA, CTP, PHR/SPHR, CSCP, DipIFR, FMP, IFRS and Professional Diploma in Marketing. In fact, Khalil is a Morgan Alumni and studied for his CPA using the Becker CPA Review at Morgan. The power of professional education drives progress and development. It is not a luxury but rather a necessity, if the Middle East and North Africa (Mena) region wishes to play a leading role in the global economy. And this is why Khalil has always been keen to share his knowledge with others, long before he became Morgan International’s CEO. In the past, he organised and presented specialised training and courses on IFRS, CPA and other pertinent topics within the field, attracting the interest of major regional and international firms across varying industries. He was nominated the best instructor at Morgan International for teaching US CPA; CFA levels 1 and 2; CIA; Diploma in IFRS and CMA. “Teaching at Morgan has been an extremely rewarding experience, it allowed me to share my knowledge with aspiring professionals across the region, given me the opportunity to expand my network base and kept me abreast of the latest trends in the accounting and finance field”. Khalil acknowledges that his passion for education and ability to make an impact would be incomplete without real-life work experience and exposure to the challenges in the marketplace. His twelve year career has been eventful and has seen him gain invaluable audit, advisory and investment experience at reputable regional and international firms. He says that each milestone in his career enriched his understanding of the industry and helped him identify knowledge gaps and the skills needed to address new developments. “Last year particularly provided me with unparalleled exposure that helped me accomplish a lot as the Chief Financial Officer for Zain, Saudi Arabia (a listed telecom company) and the Chairman-General Manager of Centre for Corporate Services (a subsidiary of Morgan International),” he says proudly. Before becoming Morgan International’s CEO, Khalil was responsible for over 100 employees at the procurement, logistics, treasury, corporate finance, investor relations, financial planning, budgeting and reporting, accounting and taxation and management accounting departments. His active role as CFO meant he was highly involved in strategic decision-making and this prepped him to seamlessly transition to CEO. Teaching at Morgan International has been an extremely rewarding experience, it allowed me to share my knowledge with other aspiring professionals across the region. One of his career highlights came in 2012, while he was still a CFO. Khalil led the supervision, structuring and execution of the Rights Issuance of Zain Saudi Arabia amounting to $1.6 billion. This transaction represented the largest investment banking transaction in the GCC region. He was also behind an international debt arrangement amounting to $325 million. Khalil was a pioneer with vision long before he joined Zain as can be seen in his establishing a subsidiary of Morgan International, Centre for Corporate Services (CCS), while acting as the Head of Corporate Finance at Middle East Capital Group (MECG), a subsidiary of the First National Bank S.A.L. His journey is a testimony of how accounting and auditing can be a springboard for a rewarding career. He began his career at one of the ‘Big 4’ auditing firms as an Assistant Auditor and later as an Experienced Manager in the Assurance and Business Advisory division. During this time, he worked on advisory and audit projects in nine countries from his base office while dealing with audit assignments, dispute analysis engagements and financial due diligence mandates. During his time at the ‘Big 4’ firm, he was promoted to manager in only one year (half the time it usually takes) and was afterwards nominated as audit methodology champion. Recognised for this talent, Khalil was then hired by Al‐Khabeer Capital, a regional investment bank with over $200 million of capital and offices across Jeddah, Riyadh and Bahrain. He became Vice President of Investment Banking in only six months. 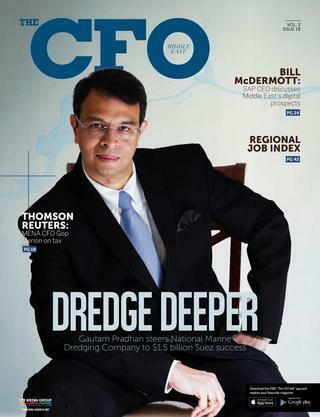 He says all this experience laid the foundations to successfully take on the responsibilities of a CFO and rise to the expectations of a CEO. “Historically CFOs were more financially driven, while nowadays they have become more involved in strategic decision making and operational activities, which kind of prepares one to wear the CEO’s hat. I am a firm believer that in order to succeed as a CEO, it is imperative that one acquires a deep comprehension of accounting and financial concepts and this is something that will allow a person to persevere and make strategic decisions about the direction of the company,” he says. Now as the CEO of Morgan International Khalil says he has a vision for the finance and accounting industry… and plans to use his new position to promote the profession. This vision involves attracting talent to the field, promoting excellence, filling the ‘pressing CFO knowledge gap’ and helping the Mena region move towards reporting standards best suited to this era of globalised business. “Therefore local talents need to enhance their skills through professional certification to meet these demands as they have an important role to play in this rapidly growing economy,” he says. Morgan’s accounting, auditing and finance portfolio includes CPA, ACCA, CIA, CMA, CFA and IFRS workshops and certification programmes. Khalil says he is excited to lead Morgan into a new phase by enhancing the educational platform, learning experience and delivery of the programmes, that will in turn benefit individuals as well as employers who wish to train their staff, in order to assist their company in gaining a competitive advantage. “I am proud to be a part of Morgan International, a leader in the professional education field. As the CEO, I foresee a plethora of opportunities for Morgan such as organic expansion, acquisitions, listing as a public company, and penetrating new markets… just to name a few,” he adds.